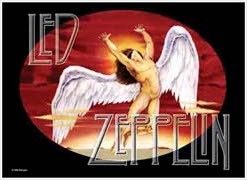 The Led Zeppelin Icarus design graces this textile tapestry type poster. These high quality posters are screen printed on 30" x40" pieces of sheer fabric that are soft-as-silk and can be hung on a wall or from a ceiling or as a flag on a pole. They won't rip like paper posters. Lasts for years! Officially licensed Led Zeppelin merchandise.